Commerce for the United States of America in the early 1800s was firmly anchored in the farms and small towns along the Eastern Seaboard, yet travel among the new country’s states was difficult and slow. Goods and people transported over land moved along a slowly developing system of turnpikes; water provided an alternate route, with ships traveling between ports along the East Coast. The new republic needed a better system for a growing economy that was increasingly becoming interconnected, and in the era before internal combustion engines, steamships, and railroads, the people of the early 1800s turned to canals to enhance transportation within and between states. Canals are waterways cut through land for navigation or transportation purposes. The Erie Canal, which ran from Lake Erie at Buffalo to Albany, New York, opened in 1825 and provided a route from the Midwest states to the Atlantic Ocean. It was an economic boon to the early United States of America and helped open settlement to the West. It also helped make New York City a major center for commerce. Businessmen and farmers in Connecticut were concerned that the goods produced and grown in the state would not efficiently make their way to major markets. In 1822 businessmen in New Haven started discussing the building of a canal from the Connecticut tidewater of their city to the Massachusetts border and beyond. 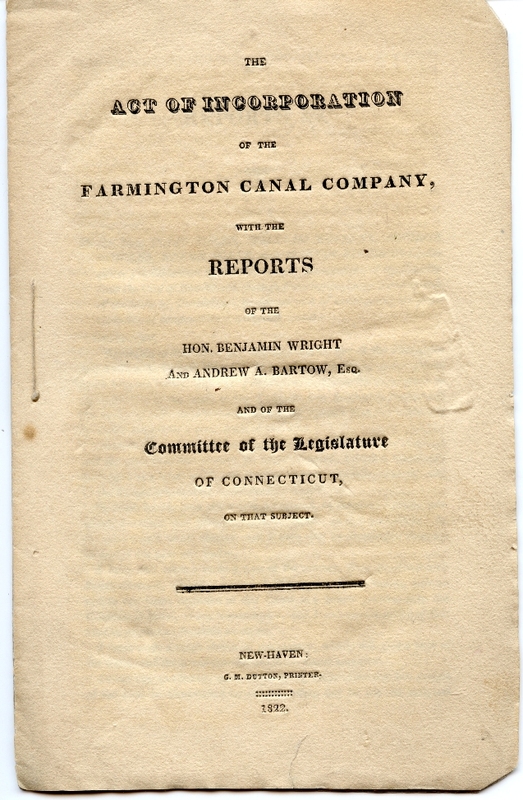 The Farmington Canal Company was established in May 1822 and was granted a charter by the state. The company found it difficult to raise money to build the canal but was able to break ground in 1825 and the first stretch of the waterway, from New Haven to Farmington, opened in 1828. The canal, when completed in 1835, eventually ran from New Haven to Northampton, Massachusetts. 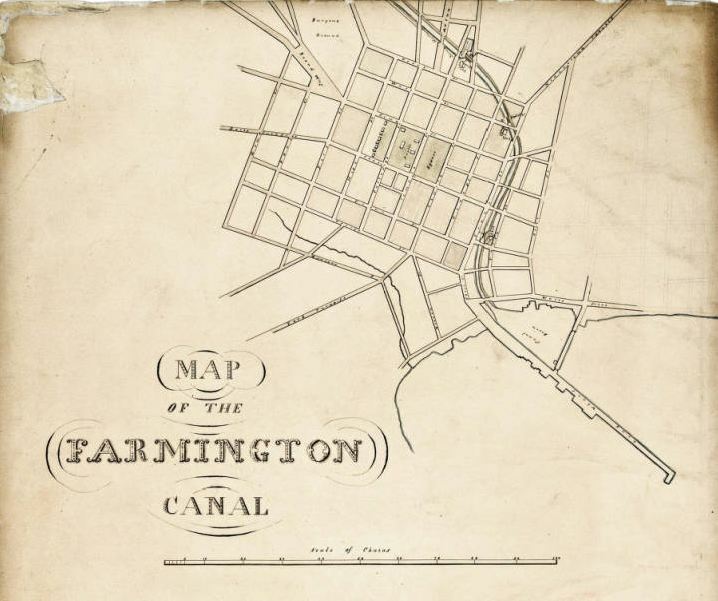 The Farmington Canal was never an economic success, partly due to its completion occurring at the point when all talk of new methods of transportation turned to railroads. But, like other canals developed in the early US, the Farmington Canal serves as an important example of how developments in transportation played a pivotal role in facilitating the young country’s industrial activity by making it possible to move raw goods to factories and finished products to market at greater speed. The canal is also a sign of how some in Connecticut strove to develop its potential on the cusp of the Industrial Revolution. Improved interstate transportation became one factor among many that contributed to the country’s success as an economic and industrial powerhouse of the late 1800s. Contributed by Laura Smith, Curator for Business, Railroad, and Labor Collections, Archives & Special Collections at the University of Connecticut Libraries.